Fr Chris has been the Rector of St Cross with St Paul and St George since March 2017. Before that he was in a parish in Croydon and before that he was a teacher in the East End of London. 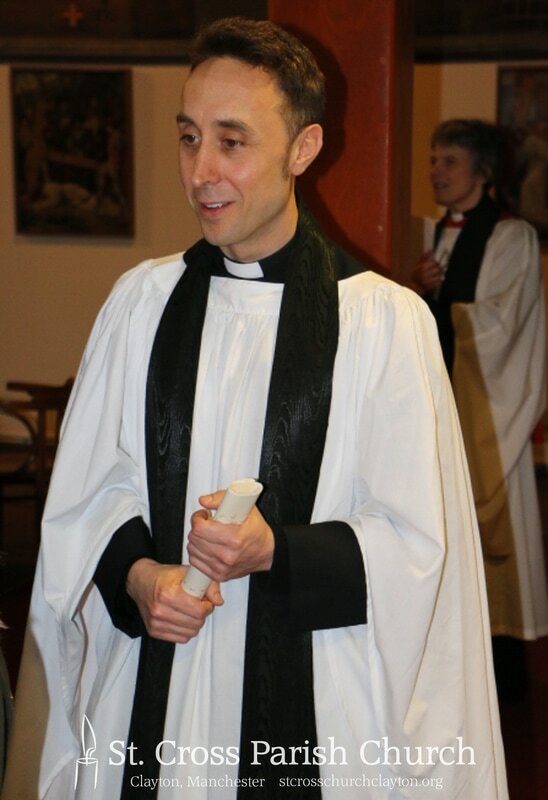 Chris trained for ordained ministry at Westcott House, Cambridge, where he completed an MA in Pastoral Theology. It was during his training at Westcott that Chris completed a Contextual Theology placement at St Anne’s in Manchester. It was there that he began to realise that Manchester might be the place God would call him back to. ​Chris has two cats, Isserley and Tom-Tom. Tom-Tom was a stray who wandered into Chris’s garden in Croydon, and over time and after many bowls of Felix served to him al fresco, Tom-Tom decided to move in permanently. Chris enjoys keeping fit. Occasionally he can be seen running around the parish, but he also swims and occasionally lifts weights although you wouldn’t think it to look at him. Chris’s other hobbies include speaking German, cooking vegetarian food, sitting in cafes and going to the flicks.